industrial Strength Samples and D.A.V.E. 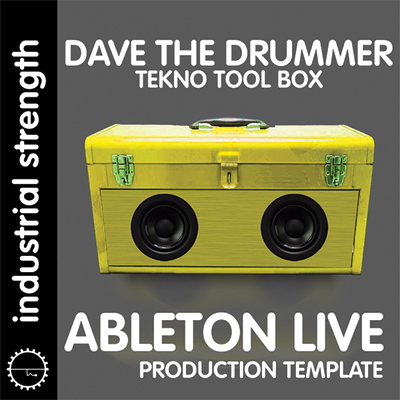 the Drummer deliver an epic Techno pack of One-shots locked and loaded for Ableton Live. D.A.V.E the Drummer's Ableton Live Production pack contains a mother load of raw and ripping Drumshots and Synths. You'll find driving Bass Shots, tight Drums, and cutting FX. With a full range of sounds, this versatile pack can slay serious damage in any style of Techno, from Acid to Minimal, Tribal, Sharenz, and beyond. This special Ableton Live pack is primed with Drum Rack patches and Simpler Synth patches. Load the shot templates into your favorite Ableton samplers to craft custom beats, apply plug-ins, and trick these sounds to the next level. We pumped up every patch and left enough headroom to add your own FX and EQ. To produce this monster pack, D.A.V.E. the Drummer mined his massive personal sound vault and analogue synth collection. D.A.V.E. 's vast knowledge of sound design has led to more than 150 production credits as a key force in the U.K.'s underground Techno scene. His sounds are found on labels worldwide, and his tracks are spun by legendary DJs including Carl Cox, Chris Liberator, and Lenny Dee. Now he's bringing his legendary chops to your DAW in the special version of his ground breaking sample pack Tekno Tool Box. Give you tracks that underground touch: we've got the tools for any Techno job right here.